Set-up Reduction, also known as Quick Changeover is a systematic approach that enables organizations to build on the principles of the Single Minute Exchange of Die (SMED) system to dramatically reduce or eliminate changeover time. S.M.E.D. is a powerful tool for reducing downtime due to setups and changeovers. The name suggests the method by which equipment can be changed from one product to the next in the most effective way, and in the shortest possible time. 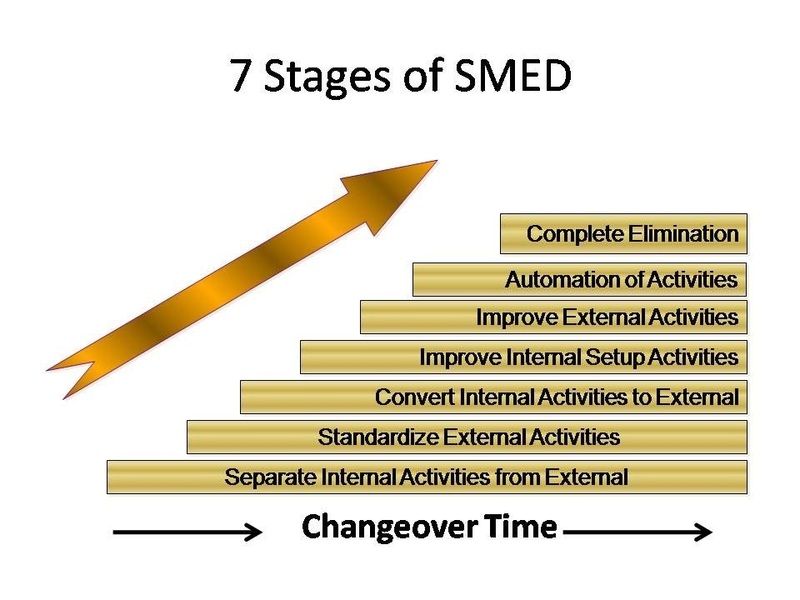 Effective SMED programs identify and separate the changeover process into key operations. External Setup involves operations that can be done while the machine is running and before the changeover process begins, Internal Setup are those that must take place when the equipment is stopped. SMED and quick changeover have many benefits to the manufacturer..
1) WIP and lot size reduction. 2) Finished goods inventory reduction. Benefits of Single Minute Exchange Of Dies. Methodology & Tools of Single Minute Exchange Of Dies. Single Minute Exchange Of Dies Training in Pune. Online Single Minute Exchange Of Dies Training Program. Send Online Single Minute Exchange Of Dies Enquiry. Single Minute Exchange Of Dies Implementation. The Improsys's SMED Program give participants how SMED works, its techniques and how to implement it in the organization for effective results. 1) Any individual who wish to learn SMED and its tools.